August 1, 2012 (Hanover, NH) – Tiltfactor Laboratory proudly presents two new games: buffalo™ and Awkward Moment™. 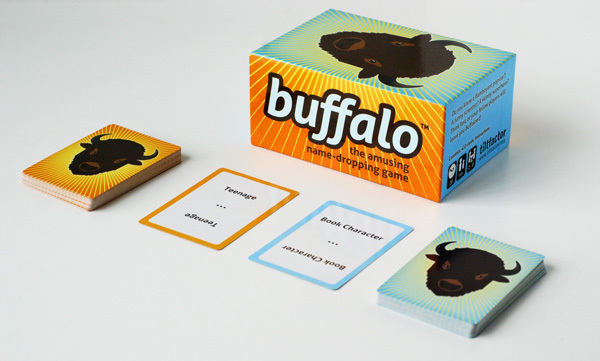 buffalo is a card game of quick wits and zany combinations that requires players to flex their recollection muscles. In each round, players race to make matches using cards listing noun and adjective descriptors. The first to shout out the name of a real person or fictional character who matches the descriptors on two or more word cards, claims the matched cards, and flips over a new noun/adjective pair. When the deck runs out, the player who collected the most cards wins. 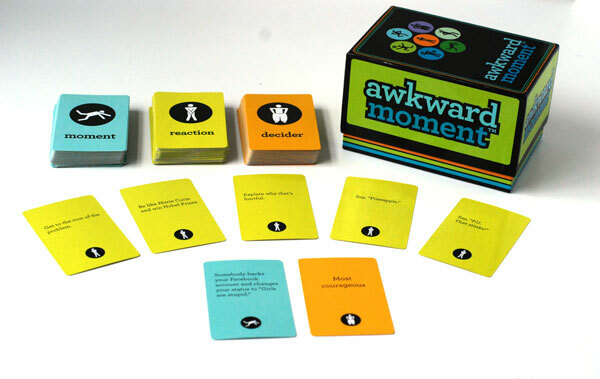 Awkward Moment is lively party game that puts 3-8 players in terrifically awkward social situations. Players take turns assuming the role of the Decider. The Decider reveals a Moment Card that describes a hysterical, embarrassing, or stressful situation for the group and a Decider Card that provides a guideline for choosing a winning Reaction. Players submit a Reaction Card from their hand face down, and the Decider selects the Reaction Card that he/she thinks is the best response to the Moment, given the Decider Card’s rule. buffalo is a 20 minute party game for adults and families (2-8 players ages 14 and up). Awkward Moment is a 20 minute game for middle and high school students (3-8 players ages 12 and up). Both games are available for pre-order at tiltfactor.org, with shipments starting in September.